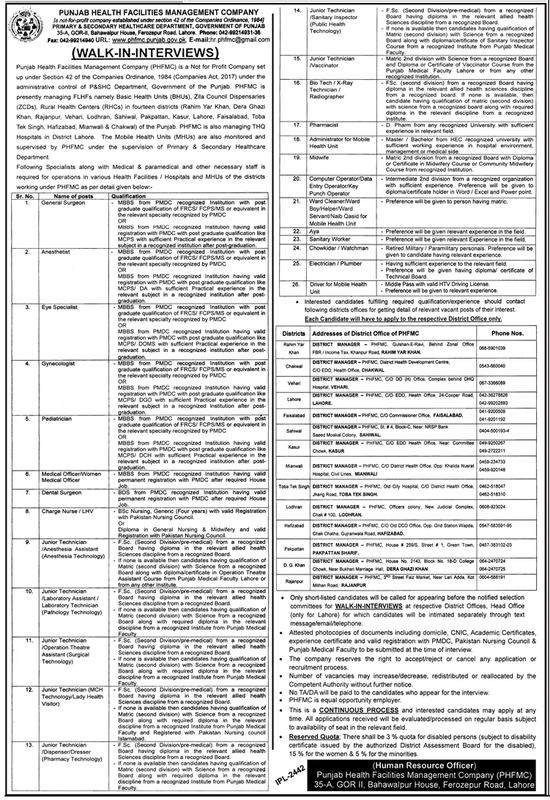 Applications are being offered from the Punjab Health Facilities Management Company Jobs 2019 Latest Advertisement. 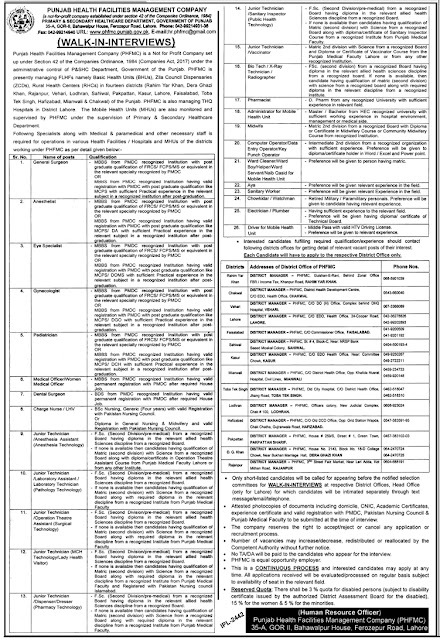 Jobs in opportunity Punjab Health Facilities Management Company Jobs 2019. Apply for the various posts of Punjab Health Facilities Management Company (PHFMC) that is a Not for Profit Company set up under Section 42 of the Companies Ordinance, & 1984 (Companies Act, 2017) under the administrative control of P&SHC Department, Government of Punjab. Sahiwal, Pakpattan, Kasur, Lahore, Faisalabad, Toba Tek Singh, Hafizabad, Mianwali & Chakwal) of the Punjab provinces. PHFMC is also working THQ Hospitals in District Lahore. Applicants are required to apply for the following posts which include; General Surgeon, Anesthesia, Eye Specialist, Pediatrician, Medical Officers, Dental Surgeon, Charge Nurse, Junior Technician, X-Ray Technician, Pharmacist, Administration Midwife, Computer Operator, Ward Cleaner, Aya, Sanitary Worker, Chowkidar, Electrician, & Driver for Mobile Health Unit. Let's have a look at its applying conditions below. MBBS, BDS, BSC, FSC Pharm, MSc, Matric & Middle with relevant several years’ skill are needed to hold these posts. How to Apply for PHFMC jobs in March 2019? Interested applicants are required to submit attested copies of attested photocopies of documents including domicile, CNIC, Academic Certificates, experience certificate and valid registration with PMDC, Pakistan Nursing Council & Punjab Medical Faculty at the time of interview.  The number of vacancies may increase/decrease, redistributed or reallocated by the Competent Authority without further notice.  Only shortlisted candidates will be entertained for an interview.  Candidates should bring all original documents at the time of interview.  No TA/DA will be funded to any candidate for appearing in Test / Interview.